Author comes out as gay, accuses publisher of blackmail. Ngugi wa Thiong’o launches a controversial book in Kenya–but it’s kept so hush-hush for security reasons that no one shows up. The Kennedy clan skips the launch of Jack’s Widow, which depicts Jacquie Kennedy Onassis as a CIA agent. Na, the Babu doesn’t care how exciting book launches are elsewhere in the world, they can’t compare with the Last Mughal launch he went to yesterday. “Bring your card or you won’t be let in!” publishers Penguin warned us. “The British Council’s being tough about cards, so please bring yours,” the author William Dalrymple warned us. “We can’t let you in unless you’re carrying a card,” the British Council warned us. This was for very good reasons; the Council’s recent research into security risks and terrorist activity indicates that over 80 per cent of bomb-carrying, book-launch-infiltrating terrorists NEVER carry the invite with them. Nor do they RSVP, the unmannerly louts. 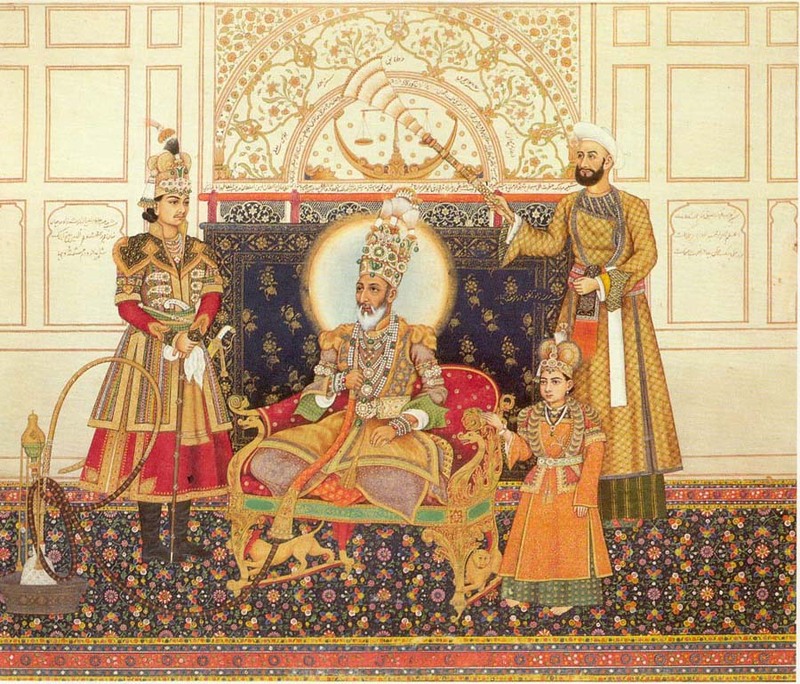 The usually genial security chappie at the Council was taking no chances, he examined our cards carefully, just in case we were trying to sneak in using a Mughal-inspired Xmas card instead of the launch invite thingie with the portrait of Bahadur Shah Zafar (in Noel Coward dressing gown). The Char Bagh, which is normally where louche journos sneak out for a smoke and a drink in the middle of the more dreary book launches, had been transformed with the soft light of earthern diyas, inviting mattresses and a stage decorated with chandeliers and hookahs into a suitably Mughal-court-meets-Umrao-Jaan-launch setting. The Babu was charmed, though others were more critical. “The blasted soft light of those damned earthen diyas is attracting mosquitoes,” grumbled a friend, who also pointed out that the inviting mattresses were paired with recalcitrant bolsters that shot into the next guest’s lap the moment you leaned an elbow on them. Mine put up stiff resistance, but I did manage to wrestle it into submission in the end, and author Rana Dasgupta was kind enough to display his WWF Elbow-Lock move, guarantted to keep even the most ornery bolster pinned to the ground. 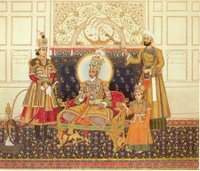 But the reading was brilliant–as this report suggests, we were all listening in hush as William Dalrymple, Mahmood Farooqui and Radhika Chopra blended Ghalib’s ghazals, gut-wrenching accounts of the carcasses that littered Delhi’s streets after the mutiny and Bahadur Shah Zafar’s poignant poetry for an hour. So died Timur’s descendant, now leading a posthumous life as a sort of Saint Zafar in Burma. Ah, those lines from Ghalib’s letters – they are perhaps the most oft quoted in any account of the trauma of post-1857 Delhi. If you haven’t done so already, you absolutely must read “Delhi Between the Two Empires” by Narayani Gupta. It’s the most amazing account of late-19th century Delhi, and I suspect Dalrymple’s book covers pretty much the same material. Gail Minault at University of Texas Austin has been working on a book on the cultural history of 19th century Delhi for quite a while. I don’t think she’s published it yet.